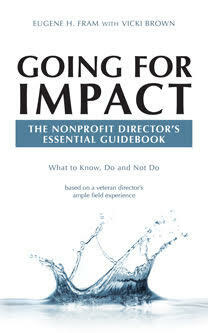 “Going For Impact” Can Be Helpful to Nonprofit Boards & Managers. I recently encountered two different nonprofit board related problems. The first was a board member, a major donor, who was constantly bringing minor issues, such as the type of hall cleaning fluids being used, to the CEO & board colleagues. Another was a board chair whose organization had a highly competent CEO. But the person needed to have better interpersonal relationships with individual board members. If your board is encountering these types of “wicked” problems, the book, “Going For Impact: The Nonprofit Director’s Essential Guide Book–What to Know Do and Not Do.” can be of substantial assistance. ← Establishing Effective Nonprofit Board Committees – What to Do. But these are “real” situations, and the book has advice about eliminating micromanagement and helping CEOs to improve their professional skills. Hope you enjoy the post I am about to release. Thanks for commentating. It give me an opportunity to clarify my missions and comments– trying to be transparent .